All morning I thought Oakley was chewing on one of his bones with my computer chord resting nicely underneath him. Later on when I noticed the light on my charger was off, I realized he had been gnawing through the chord! Good thing he didn’t get zapped! Posted February 11th, 2013 . What do they makes those Apple chargers out of that makes they so tasty for puppies? 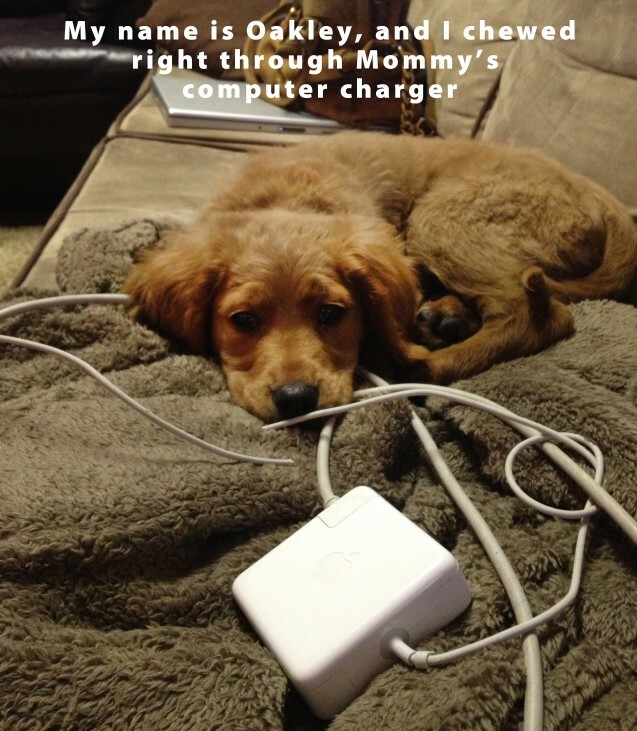 Every Foster puppy we get chews at least one apple lap top charger. No matter what we do to prevent it. They are like puppy crack. We had a pup that chewed through the mouse cord, the router cord, & the modem cord all within days of each other! We put vinegar on our power chords and our Dane never touched them again. He does look properly shamed. the Chihuahua Zoe that i had for a short time (till i saw she was depressed and needed another little friend, and gave her to a friend who had another chihuahua [and a yard to play in]) chewed through 2 apple mac chargers.